On Saturday, September 14, officials from Belize and Guatemala signed a joint agreement for the protection of the Chiquibul-Mopan-Macal and Belize watersheds. More than 40 human settlements in Belize and more than 130,000 inhabitants depend on these water resources for household activities, farming, recreation, drinking water, hydroelectricity and a healthy environment, the signatories acknowledge. Likewise, more than 75 human settlements in Guatemala and more than 100,000 inhabitants are dependent upon the Chiquibul and Mopan Rivers. In particular, the watersheds are deemed to be vital to the ecology, economy, food security and public health of the people of east central Peten, Guatemala and the central region of Belize, and it harbors a rich wildlife reservoir, as well as a history of the ancient Maya civilization and cultural diversity, the officials noted in the joint agreement. “With the signing of this agreement, the 19 leaders commit themselves to undertake cleanup campaigns, reforestation and education activities; and to promote conservation activities and cooperation, exclusively for the protection and preservation of the shared watersheds,” said Rafael Manzanero, executive director of Friends for Conservation and Development (FCD), which spearheaded this initiative. The Commonwealth of Municipalities of Southern Petén (MANMUNISURP) as well as the Municipality of Melchor de Mencos and the Community Development Councils (COCODES) reciprocated the commitment for the Guatemalan side. “The communities committed to this initiative for the period 2013-2016 include 19 alcaldes, town mayors and community development council leaders from Arenal (Belize), Benque Viejo del Carmen, San Jose Succotz, Calla Creek, Bullet Tree Falls, Cristo Rey, San Ignacio, Santa Elena, Santa Familia, Esperanza, Arenal (Guatemala), Melchor de Mencos, Cidabenque, La Polvora, Crizadero, Salpet, Los Encuentros, Santa Rosa Chiquibul, Puertas del Cielo Chiquibul and El Tikalito,” Manzanero reported. This joint agreement renews the first agreement reached in 2010 among 18 community leaders from both Belize and Guatemala. 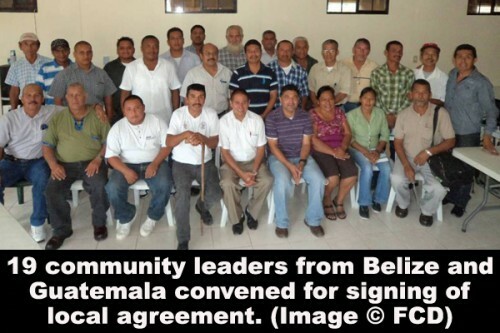 “This agreement signed by all 19 community leaders is also endorsed and signed by the president of the Commonwealth of Municipalities of Southern Petén (MANMUNISURP), Sergio Diaz; the alcalde of Melchor de Mencos, Ricardo Avila, and Friends for Conservation and Development’s executive director, Rafael Manzanero”, the FCD informed. FCD received financial support from the British Embassy for this initiative.